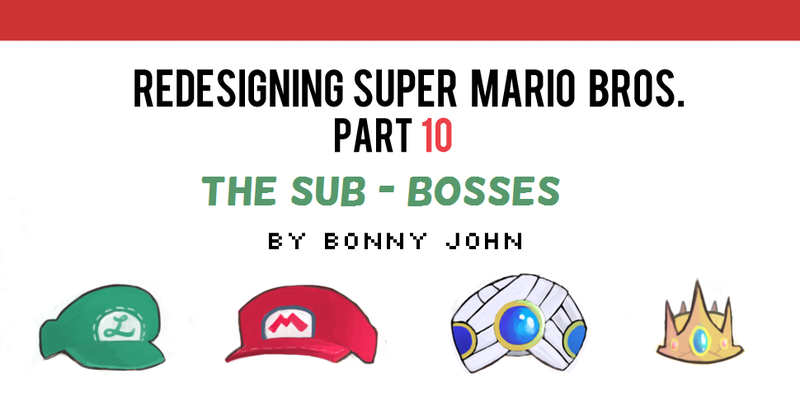 Redesigning Super Mario Bros 10 - Sub Bosses! ​Hello all! We're wrapping up the series soon, this is the second to last set! We're going to be taking a look at a few bosses I compiled who will stand in our heroes ways. ​As there are a lot of Mario games, the number of sub-bosses is rather high. Deciding on who to put in this set, and keeping it limited was difficult but helped by working around a keyword. That keyword was "Royalty". ​Let's see these high and mighty bosses! Oh, and if you missed part 9 of the series featuring the Koopa Korp., check it out here! There are 13 characters in that set, so check it out and come back! Redesigning Super Mario Bros 9 - Koopa Korp. Edition! After losing Cackletta, Fawful buckled under pressure and attempted to launch a solo career as a villain. Keeping his devious smile and unfaltering ego, Fawful kept up the guise that he was confident and powerful. These thoughts were of course without merit as the self proclaimed new ruler of Beanbean Kingdom was without a cause. ​Withought much to lose, Fawful foolishly sought to take down King Koopa and use whatever assets Cackletta had in her possesion to defeat Mario and get revenge on behalf of Cackletta. It was at this time that the newly resurged entity known as Wart took in Fawful, having heard of his time as an assistant to the devious Cackletta. Wart, in need of anyone who he could muster into an army found Fawful to be a good assistant, althought a bit talkative. As King Koopa's messenger - Lakitu is his eyes and ears far and away throughout the Mushroom Kingdom. Lakitu is loyal to his master and is constantly trying to impress the King, but never seems to gain any sort of affection. This is because Lakitu can get quite annoying - he talks a lot and is rather cowardly- two aspects of his character he denies. Regardless, the King is quite aware of how important his recon work is for the army. By feeding him negativity, King Koopa enforces Lakitu to work harder and harder, as he knows he is loyal and always trying to prove his worth. My redesign of Lakitu is quite drastic - Everything from his overall appearance to his vehicle has been drastically altered. Because I upgraded Lakitu to a sub-boss status, he needed to be significant in more than a few ways. When it came to giving him his cloud mount, I ran with the idea of making it an actual vehicle, something metal that looked like a cloud. As I continued to work on the draft, I soon got to a point where I realized I wasn't going to use King Koopa's famous clown car, now in modern games passed down to Bowser Jr. Giving it to Lakitu was the perfect fit. Thus, I combined the clown car with some cloud like elements to personalize it closer to Lakitu. ​Lakitu himself is a lot more thicker, and a bit chubbier all around. This is because I envision him to be rather stationary for most of the time he is seated in his vehicle causing mayhem or detailing reports to bring back to the King. ​As for Spiny, the enemies who Lakitu is known throwing down to torment the heroes, I decided to make them clock-work soldiers, taking the pin from the original Bob-ombs not featured in my redesigns and placing them on these robotic creations. Because he is constantly tossing these Spinies, I figured I should make his arms more buff! Kamek is largely responsible for all the "King" versions of normal enemies. His magic augments the creatures and their surroundings to make a larger foe that the heroes will come across and find difficult to take down. The first of these is Goomboss, the king of the Goombas. ​Goomboss is surprisingly strong - when one thinks of a Goomba, a simple stomp would suffice. Wearing a helmet crown, Goomboss has protection on his head and sharp teeth to bite with if you face him from the front. He is also surprisingly fast and can tackle opponents with great force. Because Goomboss is the eldest of the King trio, he is missing a skip in his hop (is that the right terminology? lol!) , so the key to defeating him is to wait for him to trip or let him lose his breath! Although the hierarchy of the Boos haven't been necessarily understood by E. Gadd and other like minded scientists, it is safe to say that the leader of the Boos, dubbed King Boo, is an amalgamation of hundreds of Boos that undergo some sort of transformation. In reality, it was Kamek who experimented on a means of gaining full control of the Boos. If flashed with a light, outlines of hundreds, if not thousands of Boos will be seen in the overall silhouette of a King Boo. It is a being that has taken years to form, and each generation of King Boo will look slightly different due to how it perceives it should look, using other royal figures as reference. King Boo is actually capable of speech, but is very broken. The voices of hundreds of Boos can be heard as the echoes of the undead permeate the body of who it is speaking to. Although it has above average intelligence for a Boo, King Boo can still get playful and forget to keep the "royal" air a leader of its stature should keep for presentation. Petey was once a regular Piranha plant - Nothing special, just waiting in a thick and coarse jungle for a meal to come by - when both he and the rest of the flora around him were used as an experiment by Kamek. Many of the abominations of the Mushroom Kingdom are largely Kamek's doing...Mario had seen all that and more first hand on his adventures with Yoshi on Yoshi's Island as a child. Petey Piranha sprung forth from the ground, growing larger than any other living creature in the area - his giant head could see past the top of the canopy! Kamek was happy with the creature that stood before him. Dubbed "Petey", he was made up of various parts of the forest that surrounded the once tiny Piranha Plants. Thus, he shares conciousness with a few other beings. This would explain why all the little bits around his body seem to have a lif of their own - the vines are always slithering, the petal crown on his head sway without the breeze, and the leaves scattered across his body twist and turn. The Petey depicted here is smaller than his usual form - Petey is able to grow larger and smaller depending on the area he inhabits. As he was recently summoned to an area with less water and precipitation in the air, he is smaller than usual. However, if he were to take home in Delfino, he would grow to a large size staying by larger bodies of water. ​Petey Piranha's original nature and design is rather flamboyant. I took that idea and ran with it. I mean, really ran with it. He is full of personality from head to toe - his design is VERY busy - and as explained in his backstory, he is made up of multiple pieces of flora, with the Piranha plant as the flagship representative for this creature. ​And there you have it! I'm sure a lot of you were expecting sub boss x or y (not a pokemon reference!) but selecting a few of these was pretty tough and I'm happy with the end result. If this were a real game, I'd throw in a bunch more for sure, but as this is just all conceptual and for fun, this lot will do! ​Let me know what you think about the designs - your critiques and comments are always read. I hope you enjoyed the work and the write up! As always, thanks for stopping by!